You may have a request from an agent to create a mp4 or video version of your tour. This tutorial will walk you through exporting your tour as a video. If your agent also want's the video sent to YouTube, read our support article here. 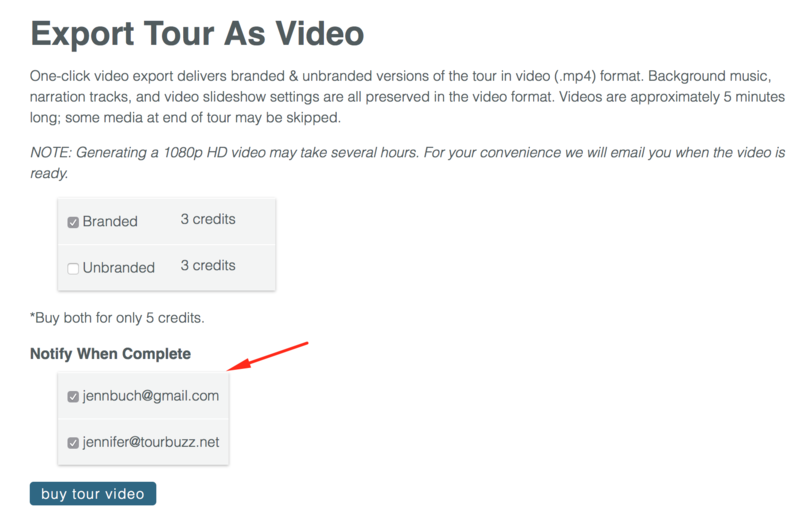 To export a video version of your tour, go to your tours page, select Edit for the desired tour, and click on Export Tour As Video. Choose Branded or Unbranded (or both). Once the video has been generated, we send out an email to let you know that the process is now complete and let you know how to download the video. Here you can select who receives this email. Doing so will charge your account. The charge is 3 credits for 1 video or 5 credits for both. The video is now being generated. **If there are any panoramas or floor plans (located in the Tour Floor Plan section) embedded in your tour, these will not be included in the video export. It only includes still image and video files. **Exporting a video may take up to two hours to complete. If the customer has connected their YouTube account (see instructions here), the video will automatically upload to their YouTube channel. If any changes have been made to the tour after you have downloaded the video, you will have the option to regenerate the video so it is updated as well. To do this, click Export Tour as Video, then click regenerate. The updated video will be sent to the selected email addresses, and will automatically be updated on YouTube as well. *There is no additional cost for regenerating a video.